In 2012, just over seven million new motorcycles were sold in Indonesia. To put that into perspective, it’s around fifteen times as many bikes sold in the USA. But Indonesia’s 240 million inhabitants are still poor by Western standards: most earn less than US$2 a day. They just happen to be crazy about motorcycles. The big sellers are small-capacity machines from Honda, Yamaha and Suzuki. The Suzuki Thunder 125 is a popular ‘city-sports bike,’ and the advertising positions it as a ‘real man’s bike.’ But with nondescript commuter-bike styling, it’s ripe for customization. Like this sleek little tracker from The Katros Garage. 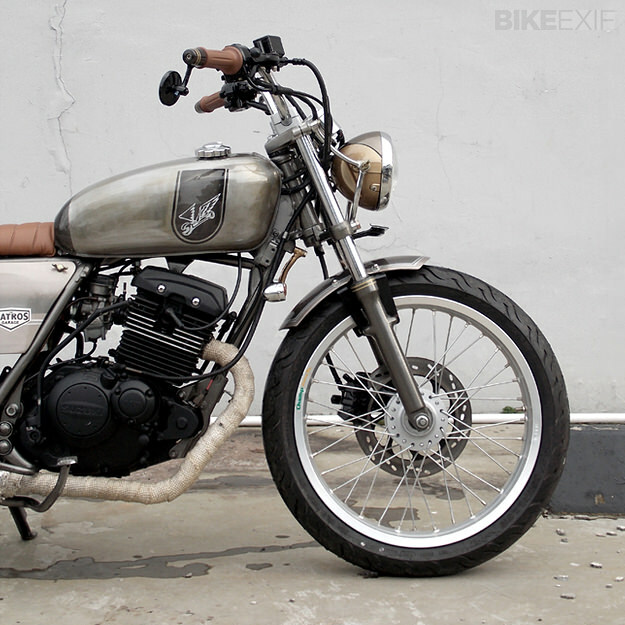 Nicknamed ‘The Momentum,’ this is the 26th build to roll out of the Katros workshop in Jakarta. The brief was to create a street tracker look, so the Thunder 125’s plastic bodywork and bulbous vinyl seat have gone. They’ve been replaced by a raw-finished metal tank and a fine-grained leather perch, with matching grips. 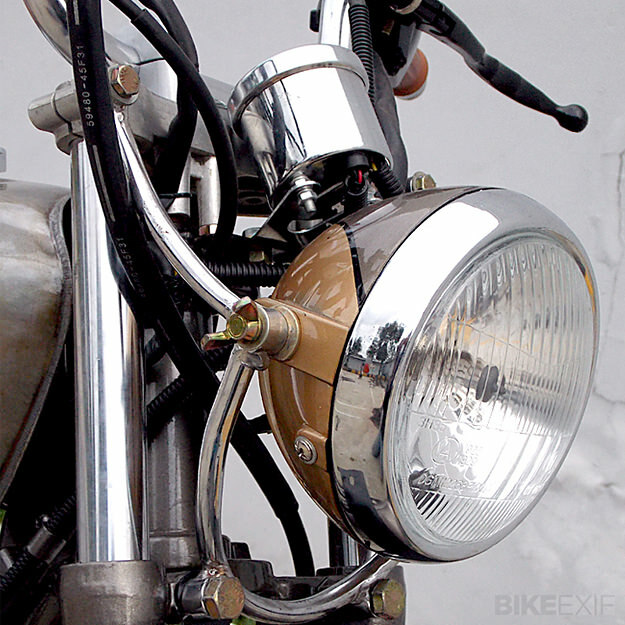 Higher bars sit behind a custom headlight unit and single instrument. The Suzuki’s engine has been tuned a little and Katros have replaced the stock mag wheels with elegant wire-spoked rims. The back wheel has dropped down a size to 17” and both ends are shod with lower profile, slightly wider rubber. 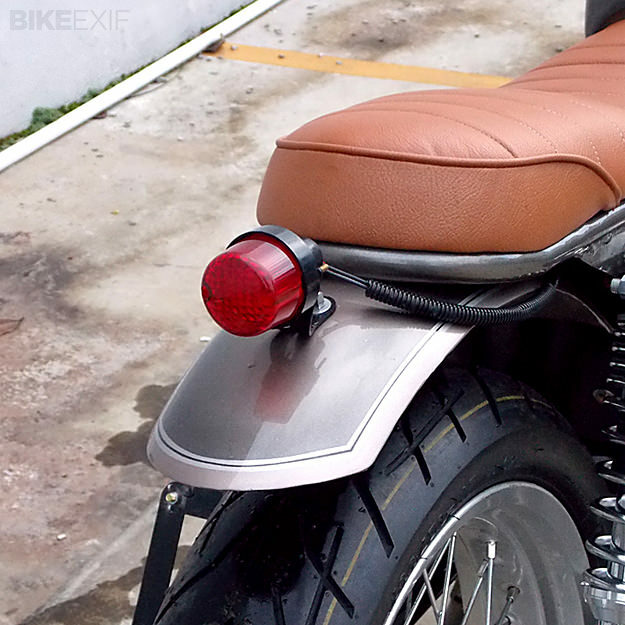 Elegant aluminum fenders keep the rider dry—because when it rains in Jakarta, it pours. ‘Momentum’ looks like a fun ride, and with a kerb weight of under 120 kg, it should be nimble enough for tight city streets. Indeed, this machine wouldn’t look out of place in London or Paris. 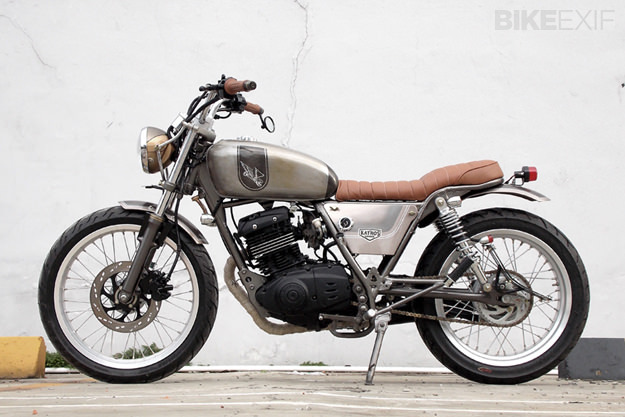 Indonesian names such as DaritzDesign, Hajarbroxx and Studio Motor are already becoming familiar to custom bike fans in the west, along with Deus’ Bali outpost. 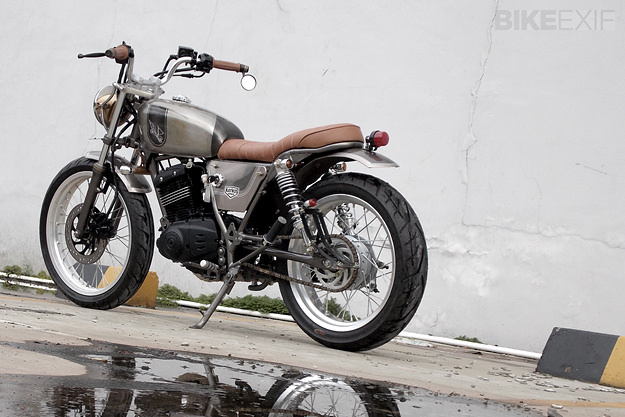 Now we can add The Katros Garage to that list: Check out their other builds right here.